“Gov. 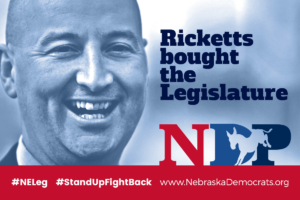 Ricketts has failed on protecting working class families on issues that affect our pocketbooks from healthcare to property taxes. While Ricketts pretended he passed some golden budget, the only people it benefits are the millionaires–a group he is very comfortable around. Nebraskans are looking for solutions we can get our hands on–expanding public education to include pre-k and community college, increased clean energy jobs, property tax reform that does not bankrupt our schools and our farmers.